People love sharing interesting content. Infographics, survey results, shocking statistics and facts are all simple content ideas that can encourage existing readers to reach out to potential new subscribers. Don’t make your readers hunt high and low to subscribe, have a button in the magazine that is easy to see on key pages of the edition. Ensure that existing readers can easily share the publication to potential new readers (perhaps even offer a referral special offer). When looking at increasing subscribers, one of the first things to do is to look at how your existing subscribers found you, and do more of that! Your web stats show a key word or phrase that is commonly searched for to find your publication, what calls to action are working best? Is there a particular article that drove an increase in subscribers your way? Pinpoint success and repeat. Why should someone subscribe to your magazine? Is their unique information, announcements that they get first? If not and the same information is available elsewhere then there is no reason for them to subscribe. So give your subscribers an exclusive, perhaps it’s the launch of a new offer, coupon for money off a product, you get the idea. It’s not just the marketing team that can help attract new subscribers. How about adding information to all email footers throughout the company so other teams too can help out too? 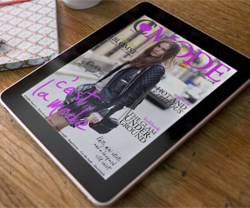 Thinking about creating your own digital magazine? try 3D Issue today and start growing your audience worldwide. For more information please email us at info@3dissue.com.